It's Pep Rally week and we are here today to share a sampling of the NEW Paper Smooches DECEMBER release with you! TWO new stamps and TEN new dies will be available to purchase on November 27th at 8:00pm pacific time. Once our release goes live, you will find our new products HERE. To celebrate BLACK FRIDAY - we have a special sale for you. At check out, type the code BFSALE15 in the coupon code box to receive 15% off your entire order. The sale ends on Saturday, November 28th at 8:00pm PT. Deadline: You have until midnight PT on Sunday, November 29th to leave a comment. Please check the Paper Smooches blog on Monday, November 30th to see if you are one of the FOUR lucky winners. Here's a list of all the hoppers in case you get sidetracked. Kara Vrabel is filling in for Pamela Ho this month, We hope Pamela is having a blast on her honeymoon! :) AND the amazing Jennifer Mc Guire is playing along with us today as well - yay! Now on to the cards! I have a couple cards today using the new Birds dies. These dies are the die version of the birds in the Natural Beauties stamp set. And the 3 birds comes with a cute little branch. I love creating little scenes and these dies make it so easy. The branch is inlaid into the smaller cloud panel. The bird is inlaid with the outline) and the whole thing was attached with some foam tape. I added a couple leaves to the branch for some more color. Isn't that little bird die adorable? This next card uses all 3 of the bird dies. This time I used the outline die cut as a reverse cut and backed it with a watercolored panel. A fun and easy way to get a rainbow on your card. For the eyes, I used a dot of Ranger enamel accents. The sentiment is from the new set Delightful Greetings. Thanks for hopping with the Paper Smooches today! The next stop on the hop is the fun and lovely Kalyn Kepner! Have fun! Love both cards especially the colorful second card. Love the card! The little birds are darling! Aloha to you, JJ! Your cards with these sweet birds are stunning! Sweet little birds!!! Love your creative use of the dies!! Inlaid die cutting is so fun and I forget to use the negative cut often-such a cute card! love both of these bird cards...I am inspired! Pretty birdies. Love how you made a rainbow card with those. Two really darling cards, JJ! I love your inlaid die cuts and beautiful clouds on the first one, and your design is so charming on the 2nd card! Great idea to use your Enamel Accents for their eyes, too! I also love your rainbow of water colors...so pretty! Those little birds are so sweet. I love the clouds on the first card. Very cute cards! Those birds are adorable! Awesome cards! I love the simplicity of the first -- so sweet. The rainbow of birds is fantastic, too! Such darling cards!!! Absolutely precious and sweet! I keep meaning to watercolor. Thanks for the inspiration. Love these cards!!! Those birds are too cute!!! Your watercoloring is beautiful! OH, I love your cards--the birds are adorable! Wonderful cards! I love the soft background on the first card - and the bright rainbow & use of negative space on the second card. Love the inlaid look and wonderful dimension created on your cards! What sweet cards!! The birdie die is really cute!!!! These are both fab. I really like how you inlaid the branch. Wonderful cards. I love the little scene with the awesome clouds. And the gorgeous colors on the get well card. Beautifully done! These are so adorable and cheerful! Beautiful coloring. OMGoodness - these are both so adorable! LOVE that die set and how you used it on both cards! Cute cards. Love the watercoloring. Those birds are so cute, the entire set is adorable. Oh my goodness, that first card is so sweet and I LOVE the die cuts and colors on the second. Fantastic! TFS and inspiring! Just love the rainbow effect on the get well card! Love this inlaid diecut technique as you used it on both cards. Love the rainbow card! Thanks for the inspiration. Who wouldn't get well after receiving such an awesome card. Love the rainbow coloring. 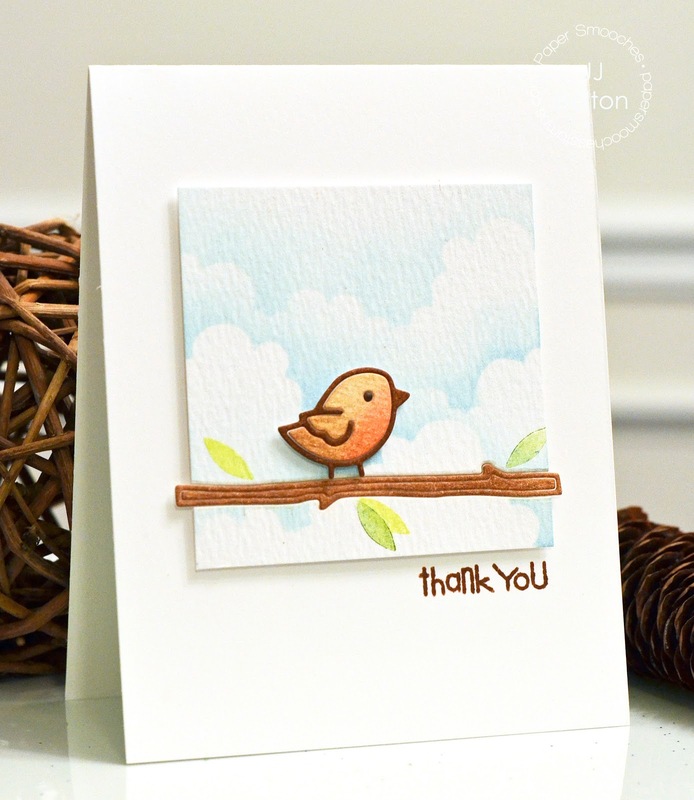 Like the dimension of the Clean & Simple w/ style bird card. Like the bird cutouts. Lovely scene on your first card. I love the subtle colors! Rainbow birds are my favorite! Love how you used these bird dies. The scene is so pretty and the rainbow birds cascading down looks awesome. Great cards. Love the get well with all the birdies. Thanks for sharing. How fun ... love those birds. especially luv that second card. a great way to add lots of color and still look classy!! Love the colors of the get well card. Love the bird cute cards. I love these little colorful birds and the inlaid pieces. I really liked both of your cards! Great job! Hello I have a question: what did you do to achieve the cloud background, did you make this or is this designer paper cut down to a panel? I love how you used both parts of the cut-outs so nothing is waisted. Super cute ideas!! I love it! Love them both, but WOW that rainbow one is amazing!!! These are both so wonderful! Love the inlaid branch on the first one. Very clever! The rainbow look always catches my eye so the bird dies are a must have for me. Aren't those birds the cutest? Love your card! How soft and dreamy clouds, love your inking, and the mini birdie, gorgeous card. Love the rainbow and plain white over top. So many things I'd love to do like this! Both are adorable, but that colorful one is just plain awesome! Great cards! Such nice cards you made! Wonderful cards! I love those birds. GORGEOUS cards JJ - they're BOTH DELIGHTFUL!!! WOW - LOVE your SWEET bird on the branch with the PRETTY sky, ADORE your rainbow of birds, SO CHEERY and an AWESOME way to use the dies!!! I love bird themed cards! The cloud background is so pretty. Darling cards! Love the detail in the bird dies! Awesomeness! This is such an adorable card! Thanks for the chance to win! What sweet cards. I just adore these sweet birds on the branch. Great background. These are so sweet, love those cute little birds!! Love that little bird and branch! So cute! Your cards are just adorable. I love your work! I'm a sucker for anything rainbow so I absolutely love that sweet get well card JJ. OMG! the cutest lil' birdies ever! Love it! both cards are great, but i especially like the second one with the rainbow peeking out through the birds! I shared on FB https://www.facebook.com/not.amanda/posts/921855271183404! Love your cards, especially the cascading birds. What a colourful way to brighten someone's day. What sweet cards! Love them both with your lovely watercolour techniques really making them special. Adorable cards. Love those cute little birds. Thanks for the inspiration. Yes the birds are so Adorable and so are your cards ! Oh my gosh I can't stand how cute these cards are!! What beautiful cards JJ! Love these sweet little birds by PS! 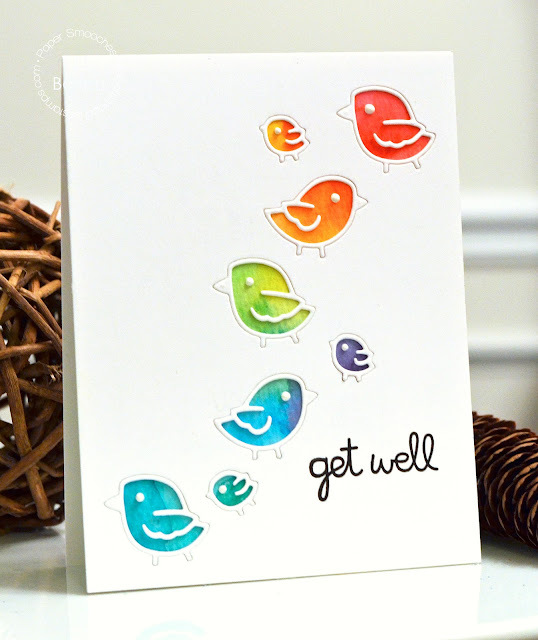 Your watercolor rainbow birds are so cheerful, it would make anyone better to get this card! LOVE!! OMG!! I saw the bird dies and couldn't think of what I would do with them. Your cards are so creative! I think my favorite is the rainbow birds. I would have never have thought of this. I just love your cards! The birds are fantastic! So cute, love this release. Thanks for sharing. Well, I love birdies so I love both cards! But the "get well" card is my favorite with the rainbow of colors (saw a full rainbow today, too!). This is scrumptious! Love every detail like that inlaid branch!!! Gorgeous!! Love your sweet bird cards! Both are so adorable - but I absolutely LOVE LOVE LOVE the adorable rainbow birds! I love little birds on branches, can't say why but they always get me. I love how you have done the second card. Lovely cards! Those little birds are adorable! 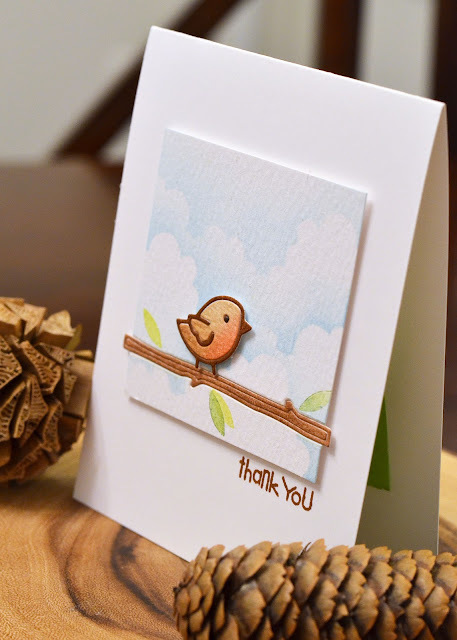 Lovin those delightful little birds...thanks for sharing the different ways to use them. Gah! cuteness overload...love those sweet birds! Beautiful cards, just love the cloud background on the first one. Very well done. Oh my! Those little birds are so cute! Your cards are awesome! These are such sweet cards! I love the new little bird die! That rainbow one is what I imagine the thoughts that birds are thinking look like. Beautiful. LOVE the first card with the inlaid branch! Great bg and such a sweet bird. The second card is just so colorful and fun! saWHEEET cards J. J. !!! I just love the little birdies you made! Yes, it IS cute! Love the cards, especially the second one. Those little birdies are so cute. Thank you for sharing. That first card is just so sweet! I love how delicate it is! The die cut birds are just so perfect. These are great, JJ. Such a cute PS bird die. Thanks! Paulette S.
since google can't get it together regarding the miss links between google and blogger for those of us who have moved on to wordpress, they don't or won't edit inaccurate information and keep things linked with closed emails, require G+ pages for profiles without blogs, etc. It's pretty sad for a company that wants to link the world, but can't work out their own issues. The get well card is over the top cute. How sweet and simple! I just miss the ability to use these dies--ideas don't come easily--so I love that you shared some ways to use these dies! I'm glad the blog hop brought me to your blog. Your designs are gorgeous! These are so, so nice! I will never look at bird dies the same! Love your technique. The texture and the design of every handmade card is just out standing really like the work.